GotZoom provides student loan repayment assistance, specializing in finding federal repayment programs to reduce your employees’ student loan burden. With nearly 70 federal student loan repayment and forgiveness programs in place today, the options to reduce student debt are exceptional. Providing GotZoom to your employees as a student loan repayment benefit puts you at the forefront of a new, high-growth benefit category and takes the student loan burden away from your employees, making them more productive and engaged! PayActiv financial wellness services solve the small-dollar need for emergencies and cash droughts by providing access to earned but unpaid wages. This helps employees avoid penalties of late payments or predatory loans to overcome their crisis. PayActiv also comes with a revolutionary allocation and savings tool to help employees plan for future, plus free financial services to pay bills online, make bank transfers, and earn rewards. HooPayz works as an extension of your HR team to be your company and employee advocate, providing radical service to reduce out-of-pocket spending, improve workplace productivity, and increase understanding of health benefits. Best Money Moves, a mobile-first service designed to help people measure financial stress and then dial it down in order to get control of their financial lives. The goal is to help people make smarter moves with their money by providing award-winning, objective information, easy-to-use tools, a point-based reward system, and a unique content-mapping system that solves financial problems quickly and easily. Every employee deserves financial peace of mind. So do you. 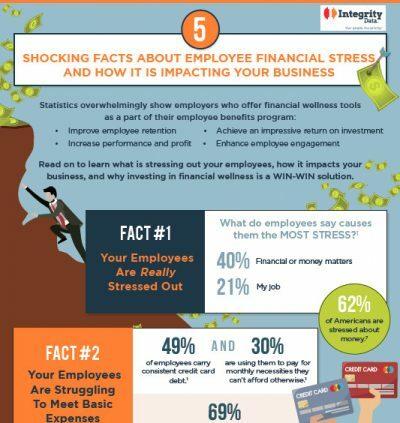 For many employees, money is the number one source of stress. Studies continue to point to financial challenges as a source of concern for employees. This hurts businesses as much as it does employees. Why? As financial challenges continue to stack up, employers are observing a decrease in productivity, poor retention rates and lost revenues. As their financial troubles grow, employees are crippled with depression and anxiety, which results in a loss of motivation and poor health (which then leads to increased healthcare costs). Providing employees with support and guidance as they navigate common financial challenges is a win-win situation. This is exactly why many employers are taking action by including financial wellness tools and programs with other traditional benefits. You may be wondering if a financial wellness program deserves a spot in your already generous benefit package. According to Prudential, the answer is a resounding YES, and they have the stats to prove it. A financial wellness program doesn’t have to be difficult to manage or expensive to deploy. To the contrary, many programs are simple and affordable. Financial wellness in the workplace becomes central to business strategy for organizations of any size to increase employee engagement and reduce employee turnover. Implementing employee financial services helps them get to the financial state of wellness they deserve. Do your financial wellness programs for employees help them tackle their biggest challenges? How? What financial wellness programs in the workplace are you implementing? Is it personalized? Do you have data to understand where your employees are? Does it drive action or change behavior? Are you able to address the root cause of their stress? We have a 20+ year history of making “Your People. Our Priority.” As an employee financial wellness broker, we want to provide organizations with a one-stop shop for well-researched, proven financial wellness tools and the best financial wellness wellness tools and the best financial wellness programs so you and your employees can thrive. We do not offer 401K plans – our focus is on financial wellness NOW so planning for financial wellness LATER becomes possible.